There was a time when you could only buy band merch at gigs or your nearest HMV or Virgin Megastore. Those days are long gone. 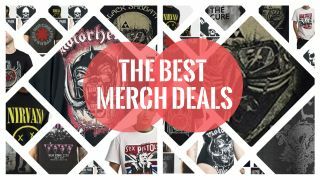 Now, everyone from Asos to Amazon, eBay to specialists like EMP sells official band merch and there are many bargains to be had. Don't even pretend you don't like this. Your life has been building to this very moment: an epic journey of Maiden fandom and heavy metal worship that reaches its fulcrum with this glorious Eddie jumper. Wear it to the office. Wear it out on Xmas Eve. Wear it to your mum and dad's. YOU WILL RULE XMAS LIKE ALEXANDER THE GREAT RULED MACEDONIA! A LEGEND 'MONGST MORTAL MEN! LOOK! It's Eddie-from-Killers but like those Star Wars men you used to collect (er, you did stop collecting those, right? ).